A different approach to the performance weekender sailing catamaran, in that a simple single chined plywood hull form is used - a way of reducing costs - with a little more interior space and comfort than most weekenders. 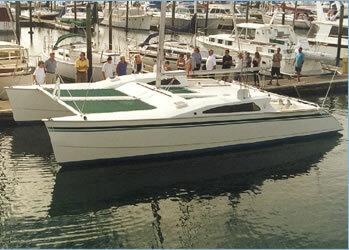 This yacht will be used by a couple for weekend cruising, winter racing and 1 or 2 extended cruises per year. Having been involved off and on with chined catamaran hull construction for more than 30 years, I know that the top end performance of these craft can surprise the disbelievers.